Appreciated wedding restaurant, Castello Marcantonio, emule of the city of Cepagatti, in Abruzzo, can also hosts business events, thanks to its elegant but sober rooms, that are well-finished in every detail. Give prestige you your image: choose Castello Marcantonio to welcome your Guests. Equipped with the best comforts and the most modern services, our castel can host meeting, conferences, business lunches in a unique location, that will make every business events a pleasant occasion for who will participate. 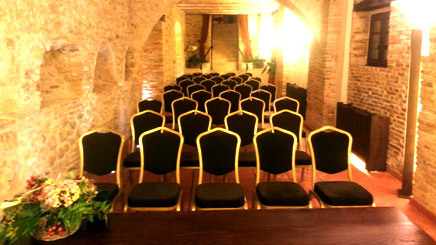 Feel free to contact us to have more info and plan your business events at Castello Marcantonio, close to Pescara. Sign up for our newsletter to stay informed about upcoming events and news of our structure. By filling in this form the user confirms having read and fully agrees with the content of the privacy information provided in accordance with GDPR 2016/679.